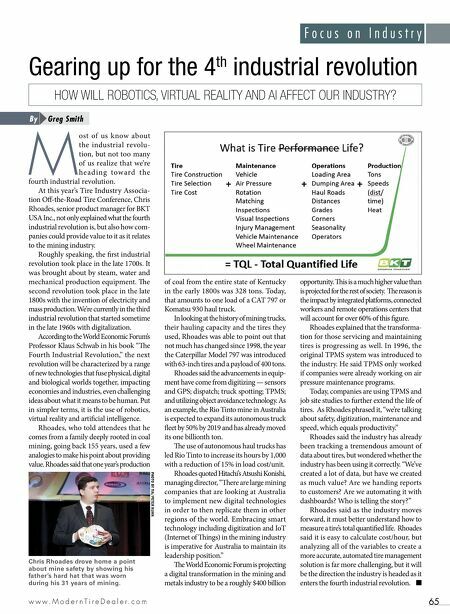 M T D J u n e 2 0 1 8 64 F o c u s o n I n d u s t r y I n the midst of a major expansion blitz in the state of Indiana, Belle Tire Distribu- tors Inc. hit a milestone. e Michigan- based tire dealer opened its 100th store. On April 30 Belle Tire opened its doors in Kokomo, Ind., and on May 12 company executives gathered for the store's official grand opening celebration. But in an interview with Modern Tire Dealer, Belle Tire President Don Barnes III says the company isn't taking a break from its long-term growth plans to dwell on the achievement. "It's an exciting milestone for us. I don't want to underplay it, but what really excites us is we feel this is the tip of the iceberg. "We're excited to continue to build out the rest of Indiana, as well as look for future growth in markets that are contiguous to where we currently have locations." The company is in the midst of an aggressive move into the Hoosier State. When Belle Tire crossed the border into Indiana in the fall of 2015, it was the first time in 30 years the company had entered a new state. (Belle Tire has four stores in northwest Ohio near Toledo.) e first four Belle Tire stores in Indiana were all near South Bend in the northern part of the state. Kokomo is Belle Tire's 10th location in the state. ree more stores are under construction, in Warsaw, Marion and Anderson, and the company is entering the state's largest market of Indianapolis. Belle Tire has sites in Greenwood and Southport. By the end of 2018 Barnes says Belle Tire will have between 15 and 18 stores in Indiana. Barnes says Belle Tire sees opportunity in Indiana because of the tire industry's tendency to be regionalized and thus "very fragmented." e company also is looking to move into bigger markets, he says. "We're going to continue that growth pattern through the new stores throughout the state of Indiana and future markets to come." In the last decade most of Belle Tire's growth has come through greenfield expansion, but Barnes says acquisitions are an option, too. ey were a key part of the company's growth in the 1990s, and "what would be important to us is that it's a great culture fit to us and be somewhat close to our existing markets to leverage our synergies." Barnes wouldn't go into detail about the company's plans for 2019 and beyond, other than to say the aggressive growth will continue. at could include filling in gaps in markets in Michigan, Indiana or Ohio, or other nearby places. In Indiana, the building blitz has led to an intense hiring blitz. e same week the Kokomo store opened, Ray Turner Jr., director of retail operations in Indiana for Belle Tire, was working recruitment events in four different cities the other four days of the week. Barnes says the company has found "a really good mix of local people" to work in its stores throughout the state. "We're a big believer that we need to have stores where people currently live. It's a big emphasis on hiring local, but also still supplementing (the staffs) with existing Belle Tire teammates. "Our company, our success has always been driven by our people. We're very, very customer centric, but the reason we've been able to be so customer centric is because of our internal customers, our employees." Barnes says the company has dedicated resources to help with the hiring, and all of the other support the new stores need. "We've always been a company that doesn't believe the good employees are out there working someplace else. We as leaders have the responsibility to coach and mentor our team and ultimately create a work environment where people can be managed, have fun, and be passionate about what they do, and see that their work has meaning. "Our job is to give our neighbors peace of mind and trust and get them back on the road fast and affordably," Barnes says. "We're very confident we can teach people tires; we can teach people service. What we're specifically looking for are people who have that natural ability to connect and create relationships with customers in order to keep them wanting to come back." 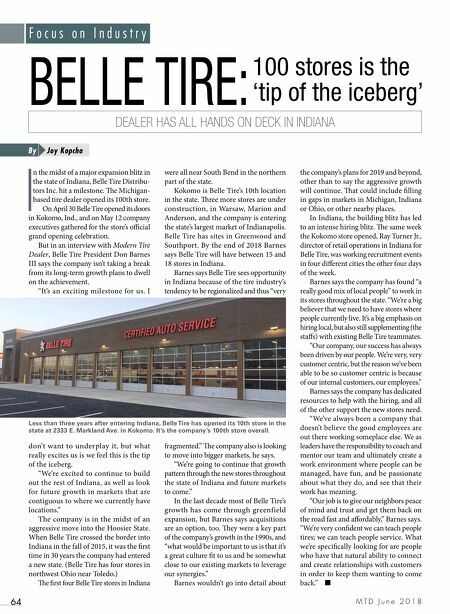 ■ BELLE TIRE: Joy Kopcha By 100 stores is the 'tip of the iceberg' DEALER HAS ALL HANDS ON DECK IN INDIANA Less than three years after entering Indiana, Belle Tire has opened its 10th store in the state at 2333 E. Markland Ave. in Kokomo. It's the company's 100th store overall.